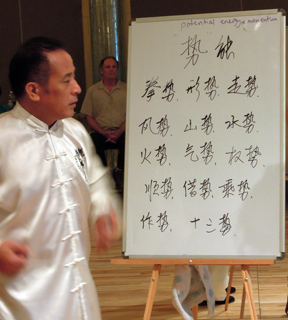 Master Wang Ming Bo, healer, Tai Chi and Tuina master, teaches method, Qigong and energy sensitivity in Tuina Chinese massage. This extraordinary video set contains methods that can be applied to any manual therapy. Master Wang also shares Wu style internal information from legendary Grandmaster Ma Yueh Liang of the Wu Chien Chuan’s lineage through Ma's indoor student, Grandmaster Wang Hao Da. Wang Ming Bo trained with Wang Hao Da for many years in Shanghai. Wang Ming Bo also studied Yang Style Taiji with Grandmaster Dong Bin and his disciple Master Ren Gang and presents Dong Bin's foundational exercises as he learned from his Grandmaster. Those who have purchased MastersFromChina.com videos will value these new additions to the catalog. These four videos offer you the basic components of a Chinese Tuina massage system or program. Master Wang’s unique approach to alignment and meridian massage provides how-to techniques whether in the office or at home. 4-Volume Set discount $150. 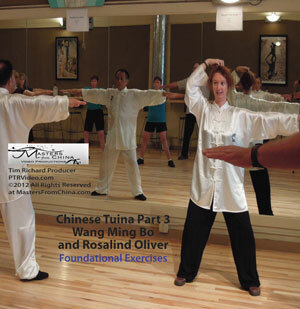 Massage therapists and other professionals interested in learning and adding this information to their practice can benefit from the instructional focus of part one and two, while part three adds qigong and Taiji training that helps build sensitivity to the energy of the meridian massage. Having greater awareness and skill in this area can help the practitioner heighten a maintenance component in their practice. One of the most valuable components of these videos is the excellent translation/interpretation offered by Master Rose Oliver, MBE, a highly trained martial artist in Yang style and many other styles. We have known Rose ("beautiful flower" in Chinese) and Master Wang for several years and have studied tai chi with them in Shanghai. 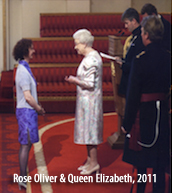 Ms. Oliver recently received the 'Member of the Order of the British Empire' award personally from the Queen of England for her distinguished cultural exchange work in Shanghai, China. In addition to the systematic approach of alignment therapy and meridian massage, two more videos provide foundational exercise and tendon and bone stretching. This style of powerstretching is very important in all internal martial practices. Both practitioners and patients will benefit from these videos: practitioners for the exercises that help cultivate sensitivity to energy in their own bodies in order to listen (ting jing) to the energy of their patients, and; patients can also develop more sensitivity by practicing the exercises and stretching. 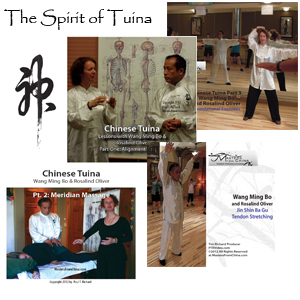 Tuina is a natural method of realigning the body. The Chinese believe that if the body is correctly aligned, one’s energy flow will also be correct. This educational video very explicitly demonstrates how to perform specific techniques for aligning the body as well as the mind intention of both the practitioner and the client. 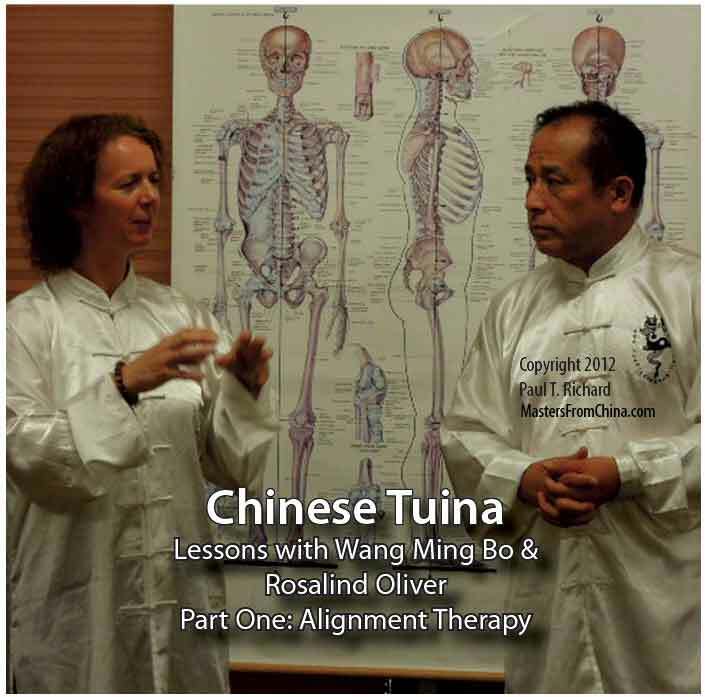 Master Wang Ming Bo demonstrates while Rosalind Oliver translates and elucidates on many aspects of Tuina. This is an excellent introduction to Tuina and Tuina techniques performed by an expert, with very clear explanations and visuals. Part One, Alignment Therapy also prepares the learner for Part Two: Meridian Massage, since alignment therapy is often performed first before conducting meridian massage. This video is an educational exploration into this ancient Chinese practice and should be viewed as a great start for the beginner and valuable treasure of insight for the professional.1.5 hr. $59. Volume 1 Tuina Alignment Therapy DVD plus shipping. 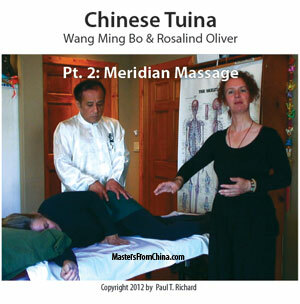 Volume 2 Tuina Meridian Massage $39 plus shipping. 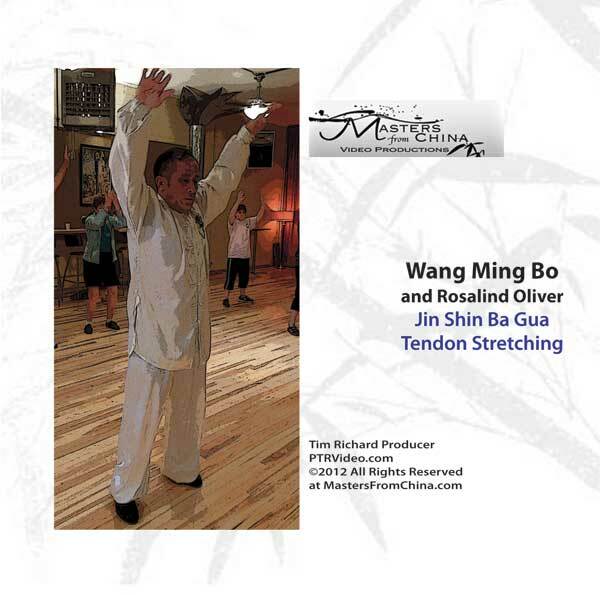 Shin Jin Ba Gu Tendon Stretching (Vol 4) $39 plus shipping. Master Gordon Xu gives a tuina demonstration and describes methods and principles at the 2004 China Camp. These three videos can be purchased as a set or individually to help clarify understanding of energy use in martial applications. Five master practitioner/teachers of Chinese internal martial arts: Master Liu Ji Fa, Master Shou Guan Shun, Master Ren Gang, Master Liu Hong Cai, and Master Wang Ming Bo each present approaches to cultivating and using energy that are truly unique and valuable for learners seeking their own path of understanding. Ms. Rose Oliver, a long-time Shanghai resident and practitioner of Chinese martial arts, translates. She and camp co-coordinator, Wang Ming Bo, have been dedicated to introducing masters who graciously share their knowledge obtained from decades of study in one or more styles of Taijiquan, Ba Gua, Lan Shou, Shaolin, and Xingyi. Learners from around the world can increase their knowledge and ability with the information presented. Produced by PT Richard in partnership with Susan A. Matthews (www.susanamatthews.com) and www.DoubleDragonAlliance.com. Vol 1 Part A- Wang Ming Bo (Yang Style) Morning Exercises. Shanghai China internal martial arts master Wang Ming Bo, assisted by Rose Oliver, leads a follow-along set of morning exercises. Using mind intention with qi. He applies some of what Wang Zhi Xiang (see below) explains about bamen wu bu in specific practice; for example, using the eyes to coax the qi and the spirit into desired action, and moving energy outside of the physical body by using mind intention. Also about balancing yin and yang and thwarting the advance of an opponent by taking advantage of his energy and use it to repel him. He repels himself in effect because it's his own energy you're utilizing. Master Wang suggest techniques, such as opening the lower back and back of the knees, to release trapped energy and help cultivate longevity. How to use energy to move. Don't use muscular/structural power. Stop thinking of yourself as muscle. To do so, think about yourself as bone structure, then go on from there to be nothing at all. Demonstrates how not to react to the touch of another person/opponent and not to concentrate on the point of contact. 'The entire body is aware.' Use the whole body to feel and to understand completely, not just arms. He talks about Gan Shou (feeling), Ting Jing (listening), Kong (emptiness), Fa Jing (explosive force), Hua (absorb and dissipate), Song (relax), Xing (heart). How much can we feel of the things around us? Listen with your body, not just with your ears, or an arm where someone is touching you. Be relaxed, don't tense up, listen with your heart. Listen to the entire person, sensing that person as a whole being. Don't use just technique to break their hold. That's not complete understanding. Become an energy being, not a physical entity, so that your opponent won't have anything to grab onto. Lecture, Demo, and Training the center of body. Master Liu gives a description of the dantien both as a point and as a field and emphasizes the importance of training the dantian. Master Liu's demonstrations, discussion and exercise leading complements the attention to energy given by others in the training camp. In push hands, he shows how he takes the energy of someone pushing on his chest through dantian then returning it to them once they are committed. This educational video is also very entertaining. Produced by Tim Richard. Lessons on the 'Power Shield.' 1hr 15 min. $29.95. Shin Jin Ba Gu is a Lan Shou style power stretching set. It helps to build good physical structure while releasing trapped qi. A very good complement to what Master Liu Hong Cai says about the need to have correct physical structure as well as energy alignment. 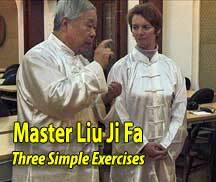 Master Shou talks about filling the body with qi. The tips of the fingers are flush, even pudgy, with qi. In push hands he pushes blindfolded to demonstrate how to sense the other person's movement with the body, not look with the eyes only. He also works with participants in Da Lu, or walking push hands. In his youth Master Wang Ming Bo practiced Chinese wrestling and boxing and was also a keen sports fan, but he began training in Taiji Quan in 1993, following an industrial accident, when both his ankles were broken and he was left bedridden; the prognosis being that he would probably not walk again. However, ever determined, around a year after his accident, he began to walk on crutches up to his local park, to get some fresh air and get out of the house. There he met Wu Style Taiji Master Wang Hao Da, who was in his late 60’s, and watched him perform the Wu Style Taiji form. Master Wang Ming Bo, keen to improve his health and get back to full fitness, became his student, first learning some basic foundation exercises and qigong, then later the Taiji form; once he had properly recovered his mobility, he went on to study push hands and sparring. 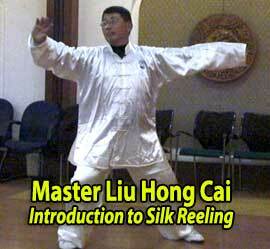 Over the years, he has also studied Chen Style and Yang Style Taiji with Master Tao Cheng Qiang. 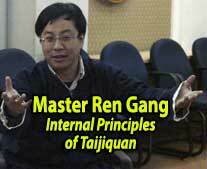 Since the passing of his teacher, Master Wang Hao Da in 2002, Master Wang has focused exclusively on Yang Style Taiji with Grandmaster Dong Bin and his disciple Master Ren Gang, beginning his studies with them in 2003. Master Wang is a generous and patient teacher, with lots of teaching experience of both western and Chinese students. He is a regular instructor for Double Dragon Alliance’s martial arts training camps, held annually in Shanghai, as well as having taught in the UK for DDA’s annual Taiji training sabbaticals, where students have thoroughly enjoyed his enthusiastic, friendly and interactive approach; whereby he makes sure that every student has a clear idea of what each of the Taiji movements really means and letting them “feel” for themselves what they are doing within the form. 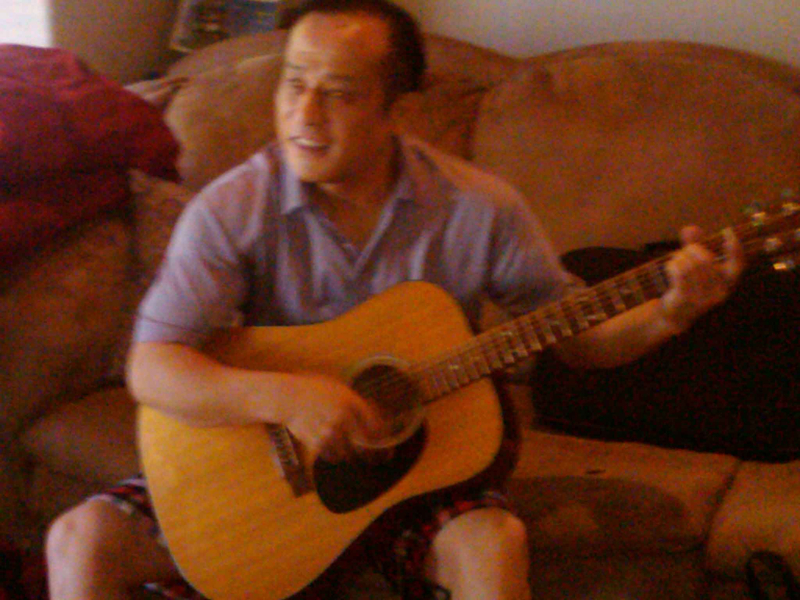 His warm and friendly nature, plus his extensive knowledge of Taiji, Tuina, Chinese Medicine and other related arts, in addition to his experience make him a talented and very generous teacher, ensuring that everyone can obtain the most from their practice and gain a deeper understanding of Taiji and other related Chinese arts and philosophies. Rose began training in Taiji Quan in 1993 in Great Britain, learning Yang Style Taiji Quan from her first teacher and husband, Sifu Rey Nelson. Together they ran “The Eastern Tai Chi and Internal Arts Research Association” in the UK, which was dedicated to promoting health, happiness and understanding of Chinese Internal Arts. 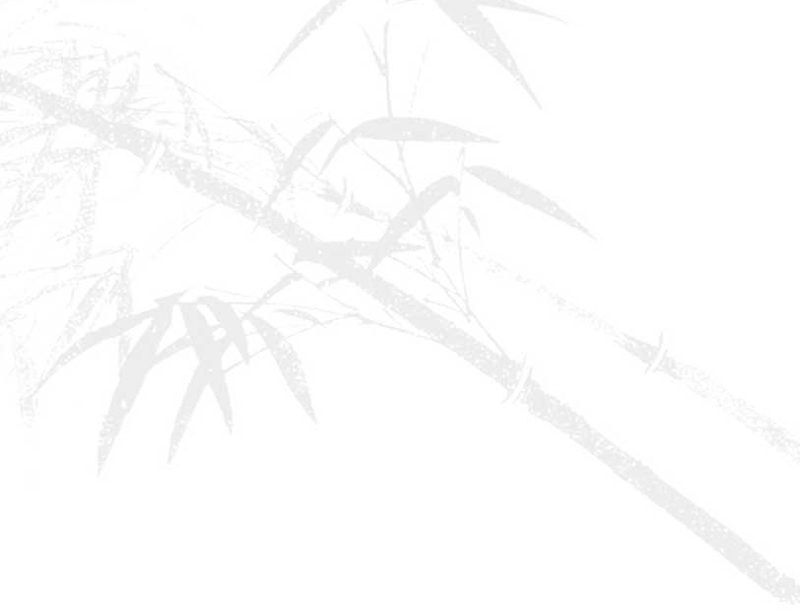 (Including Taiji Quan, Qi Gong, Daoism, Traditional Chinese Medicine and Tuina, I-Ching and other philosophies). They also ran the “Masters from China for Britain Programme”, which organized seminars around Britain, inviting high level Internal Arts Masters from across the world to come and teach and share their knowledge with students in the UK. 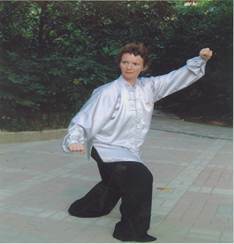 Over the years, Rose has also studied Chen Style Taiji with Master George Xu in San Francisco and Master Jiang Zhong Bao in Shanghai; plus Wu Style with Master Wang Hao Da and Master Liu Ji Fa, both senior students of the late Grandmaster Ma Yue Liang from Shanghai and Yang Style with Master Dong Bin and Master Yang Zhen Duo. Her primary focus is Yang Style Taiji, with its focus on large, expansive movements and the cultivation of energy in playing the form. With experience teaching students at their own school and for various health and adult education facilities in the UK from 1994 until their departure to Shanghai in 2000, Rose decided to found the Double Dragon Alliance Cultural Centre in Shanghai in 2005, in order to continue the work she and Rey had started in the UK; introducing Chinese natives and western expatriates to Taiji Quan and other martial arts and health systems, as well as Chinese culture.